As the extreme cold of winter blankets the area, we need to stay mindful of our pet’s health, since extreme weather affects them just as much as it affects us. Use these safety tips from your Waterloo veterinarian to keep your pet safe this winter. The easiest way to keep your pet safe and happy during extreme cold temperatures is to bring him indoors. He’ll be happiest snuggling up in the warm house alongside his family. When you do take your pet out to exercise or use the bathroom, limit the time he spends outdoors to a few minutes. 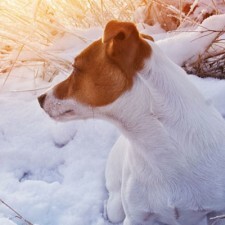 The chilly temperatures and biting wind won’t take long to affect your dog. Don’t make the mistake of thinking your pet only needs plenty of water during the hot summer months. Pets must stay hydrated at all times, so make sure there is fresh, cool water available at all times. If you put a water dish outside, check on it periodically to make sure it hasn’t frozen over. The signs of hypothermia include shivering, weak pulse, lack of coordination, pale gums, and stiffness or stillness. Always be on the lookout for these symptoms if your pet has been exposed to very cold temperatures, and call your Waterloo veterinarian’s office immediately if you notice them in your pet. With the wide variety of pet clothes available today, it’s easy to dress your pet up for the extreme temperatures. Consider getting your animal companion a sweater, coat, parka, boots, and other cold-weather accessories. These are especially helpful for shorthaired animals, pets with a thin coat, and young animals that are especially vulnerable to the extreme temperatures. Ask your veterinarian for a recommendation on good pet clothes. When you are outside with your pet, keep an eye out for banks of deep snow. Pets can fall into them, becoming trapped, or become exhausted while fighting their way out. Ice is also dangerous—a pet can slip and overextend a limb, and there may be de-icer chemicals or road salt on the ice that could potentially poison your pet. Avoid deep snow and ice and get back indoors quickly.